sailboat. 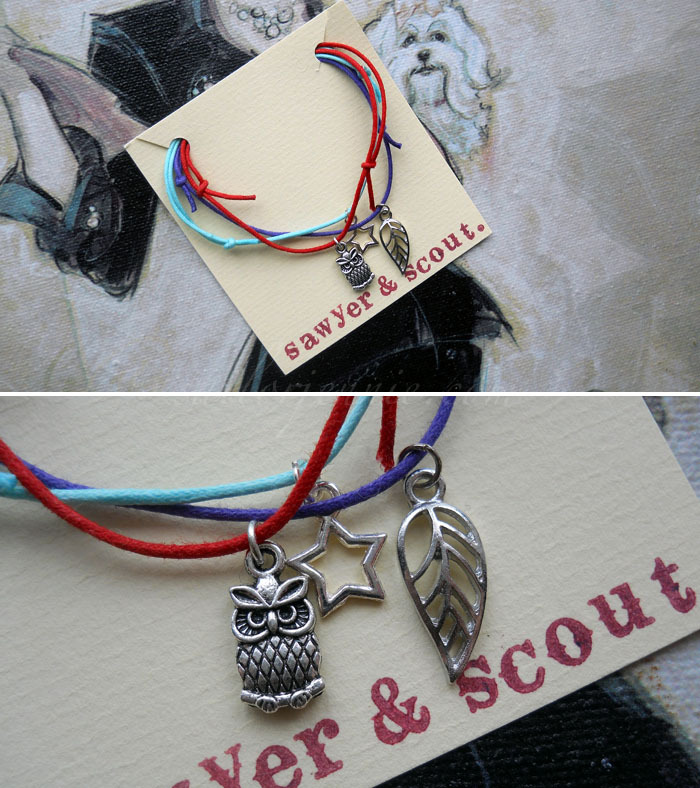 : Giveaway: Sawyer & Scout Jewellery. 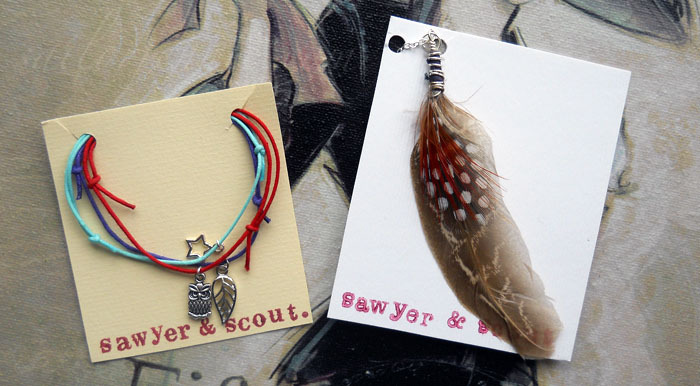 Sawyer & Scout is a super sweet online store selling lots of really beautiful items from Bunny fridge magnets that I absolutely adore, to keyring/phone charms and domino necklaces. She also has a Harry Potter inspired necklace for all of you magic lovers! The wonderful Elise, the creative lady behind Sawyer & Scout has been sweet enough to offer these super cute items of jewellery for two of my lucky readers to win! This gorgeous feather necklace would look so perfect with a simple white dress or a white vest top and some frayed denim shorts for a slight bohemian edge that is absolutely perfect for the summer festival season! This adorable little set features a little star charm on a blue bracelet, a dainty leaf charm on a purple bracelet and my favourite, a wonderful little wise owl charm on a red bracelet. These look super cute worn alone & I think they would look equally lovely paired with lots of other bracelets too for that super on trend layered look! Elise sent me a bracelet with a little anchor charm on it and I've barely taken it off since I received it! It's one of those pieces of jewellery that you can just wear all the time & it'll go with anything! I’d like you to pop over to the Sawyer & Scout online shop & then leave me a comment below letting me know what your favourite piece is! In your comment I’d also like you to let me know whether you want to be entered to win the feather necklace or the bracelets – or you can be entered for both if you would like! Finally don’t forget to leave your email address so I can contact you if you win! 1. 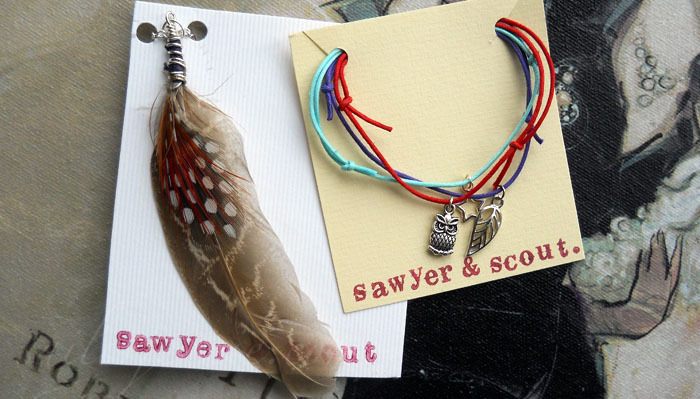 Follow Sawyer & Scout on Twitter: http://twitter.com/sawyerandscout & leave your twitter name along with your comment below! 2. 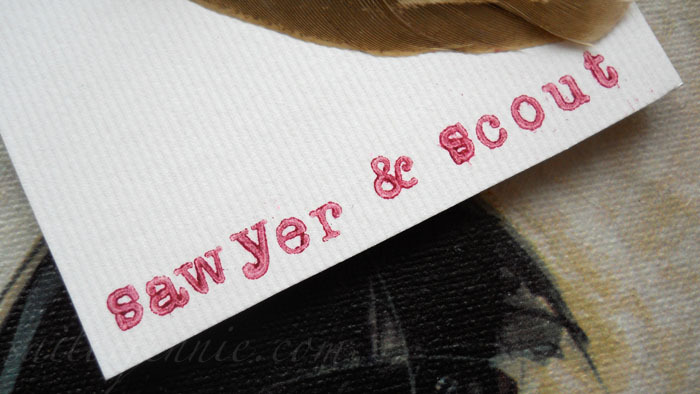 Tweet “Jennie @sailorjennie is holding a @sawyerandscout jewellery giveaway & I’d like to win! http://www.sailorjennie.com xo” & leave your twitter name or a link to your tweet in your comment below! This giveaway will be open for 2 weeks and will close on Wednesday 3rd August at midnight BST. I’ll draw the winners using random.org on Thursday 4th August. If you’re under 16 please get your parent/guardian's permission because I’ll need your postal address if you win! My favourite item in the shop is the scrapbook necklace, it's so cute! my favourite item is the wire wrap pendant, it's so pretty! :) I'd like to be entered for both the necklace and bracelets please. my favourite piece on the site is probably the gemstone rings. gorgeous stones! I'd like to be entered for both, please :) There's no way I can decide which I prefer, they're both so adorable. I love the teapot rings there so cute! The Harry Potter necklace is cool too! I would love to be enetered to win the charm bracelets. I have tweeted and & added (my name is XStary_eyesX)and have liked on facebook (Amy Kate Daniel). My email address is amydaniel@rocketmail.com. My fave piece is obviously the Harry Potter pendant, definitely one for the devoted! my favourite piece would definately be the feather necklace, it's beautiful! Enter me for both please but i'd be sooooo happy to win the necklace :) Been trying to find a necklace like it for a festival so its perfect! I also like you on facebook! My name is Lorna Patrick. Good luck everyone, got my fingers crossed! I would love to win the bracelets. They are so lovely. I'd like to enter for the necklace and bracelet! Hi Jennie, thanks for another giveaway with lovely prices! I'd love to be entered for both if i may! My favourite product is: the gemstone rings, so pretty! I also liked your facebook page, my names Jess gostelow! I am following on GFC as Bex Smith, on Twitter (& tweeted) at @OhNoItsBex and on Facebook as Bex Smith. infact i wish there were more colours i'd buy them all! I'd like to be entered to win the bracelets, they're so cute. Oooh yes please :) my favourite would actually be the feather necklace but i love the button charm bracelet too! I'd love to win either prize! I have tweeted and followed Sawyer and Scout on twitter. Please enter me for both, they're both so cute! I also really like the tooth pendant on the website and I was surprised at how affordable they are! My favorite item is definitely the gem stone rings.. their gorgeous! I want the bracelets please. What a lovely giveaway! Being the Harry Potter geek that I am, I think the Deathly Hallows Pendant is my favourite piece, but it really is all so pretty! I adore the Wire Wrap Pendent, the colour is gorgeous and i'm loving this style of jewellery lately. 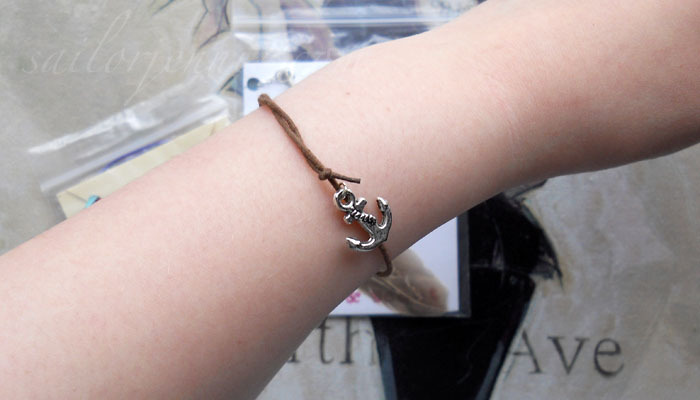 The charm bracelets are also adorable, and i'm looking for something similar myself! Mine are definitely the bracelet sets!! My favourite from the shop is the wire wrap pendent, it just looks so pretty and I love the colour of the stone. Wow such lovely jewellery! I would love to be entered fpr the bracelets as they are definately my style! My favourite piece has to be the Shell Charm Necklace, although theres so much more that I liked! I followed Sawyer & Scout on Twitter and tweeted - im daisylovesxo. I love the Deathly Hallows Inspired Pendant! My GFC is iamnotarobot, my email is chloepower@live.com, my Twitter is _ChloePower_ & my Facebook is Chloe Power! :) I would like to be entered for both prizes, please & thank you! liked you on facebook! thanks for the awesome giveaway! 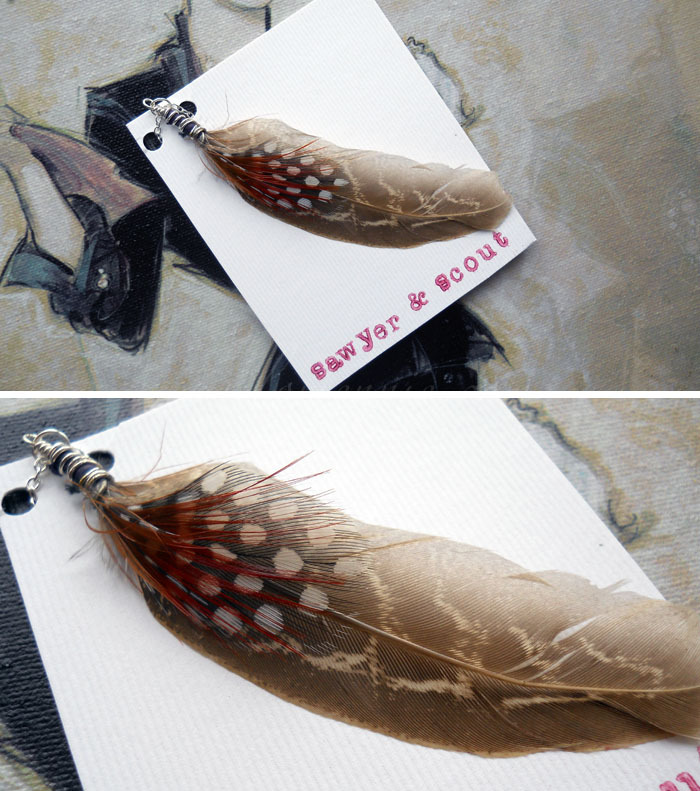 i'm loving both of the feather necklaces and the bunny magnets! i would definitely buy those magnets for my friend who loves bunnies. i love the Deathly Hallows Inspired Pendant ! and tweeted about it too! I follow Sawyer & Scout on Twitter as rmcatalina, I tweeted about this giveaway http://twitter.com/#!/rmcatalina/status/95028877738512384 and I liked the sailboat fb page as Radu Catalina.